River Girl (6:03) created by Indira Cesarine, features Storm model Julia Shvets. 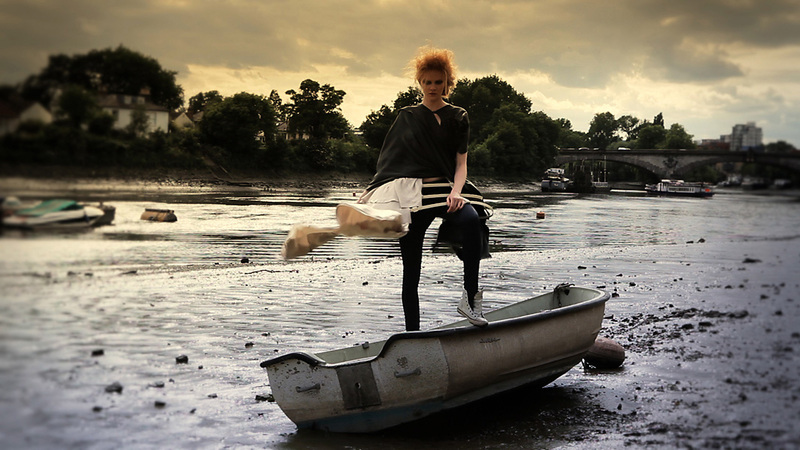 The fashion / video art film presents the story of the river goddess Belisama, as her spirit embodies the riverbanks of Chiswick. The goddess is caught between two universes, that of the modern desolate world and a time long gone, when the river was a still a sacred place. Styling by Kay Korsh with makeup by Phyllis Cohen & hair by Deborah Brider. Cinematography and editing by Indira Cesarine with music by Moby. Watch the short or extended version. Kay Korsh is a London based fashion stylist and works on a freelance basis. New Zealand born Deborah Brider began her career with hair at the age of fifteen, upon being accepted as a apprentice at Buoy Academy in Wellington. Deborah’s tutors quickly spotted her obvious potential and encouraged her to continue training overseas. She joined the multi award winning “Charlie Miller ” salon in Edinburgh an inspirational institution which taught Deborah technical skills which have been the basis of her success. As her confidence grew, Deborah’s vocation as a session hairstylist was realised and she never looked back. Deborah moved to Paris and approached the legendary hairstylist Eugene Souleiman as an assistant. Before long Deborah became part of Eugene’s trusted team and spent the next three years assisting him on shows in London, Paris, Milan and New York. As word of her ability spread Deborah found herself in demand with other top international hairstylists and collaborated with the likes of Yannick Di’s working on creative editorial shoots as well as on disciplined and precise technical campaigns. Since emerging as an individual talent Deborah works for magazines such as tatler, elle, amica italia and vogue nippon. Advertising clients include balmain, schwarzkopf, wella and L’oreal. Deborah’s professionalism and technical versatility means that she is in constant demand and enjoying inspiring clients around the globe. Phyllis’ love of painting shows in everything from her subtly enhancing natural makeup to her photo-realist body painting. She started her career as an illustrator with extensive training in portraiture, colour theory, sculpture, and composition, all skills she finds invaluable for her work. In her early twenties, Phyllis came to London, from Canada. The music scene in 1983, particularly the New Romantics, loved how she could combine illustration and makeup skills. Within a few years she was working with David Bowie, Annie Lennox, Tina Turner and Boy George to name a few. The editorial market also gave Phyllis free reign to create signature makeup stories for L’Officiel, Vogue, and Linea Italia. In the 90s, Phyllis went back to study Fine Art at Goldsmiths College and received a 1st class honours for her MA work. During this time she began researching perceptual psychology to understand how the eye and brain looks at faces. When working with celebrities, Phyllis loves to use this knowledge, to design make-ups on paper that suit the theme of the shoot, but also make the face appear younger, more feminine, and bring out the best harmonies of colour and shape for each person. She also works in this way for cosmetic companies such as Clinique, the Body Shop and SK-II who have employed her for PR junkets and to design looks for seasonal campaigns.